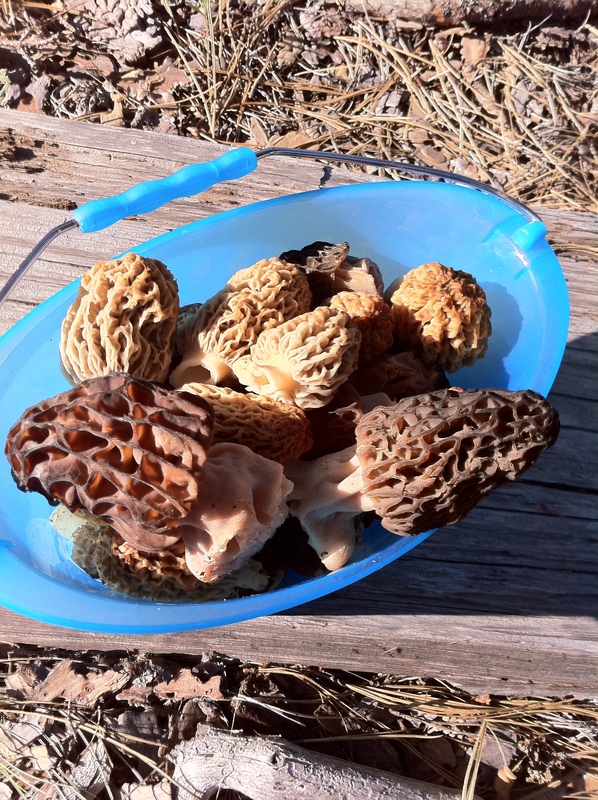 I get asked quite frequently what my obsession with Morel Mushrooms in the Spring. People often scratch their heads in their futile attempt to understand why I pursuit them, or why I even eat them. 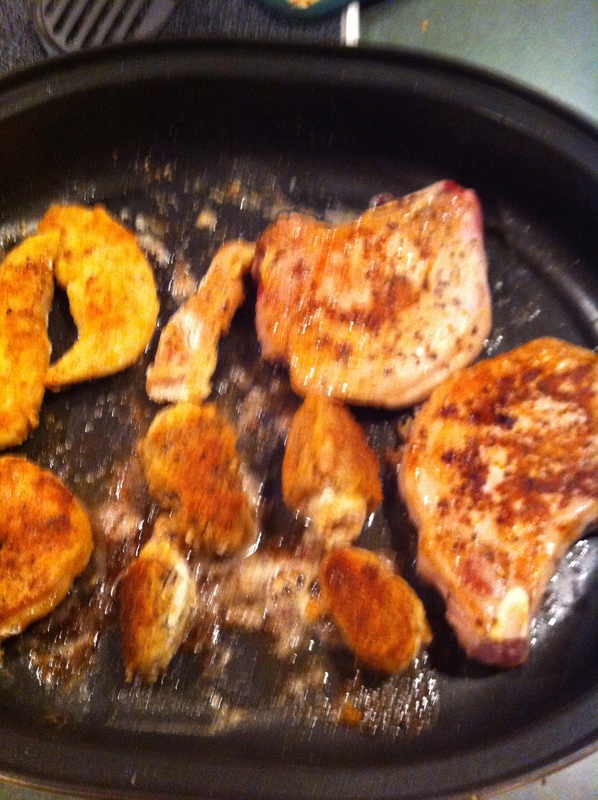 Until I make them one on a cast iron skillet, then they fully understand. 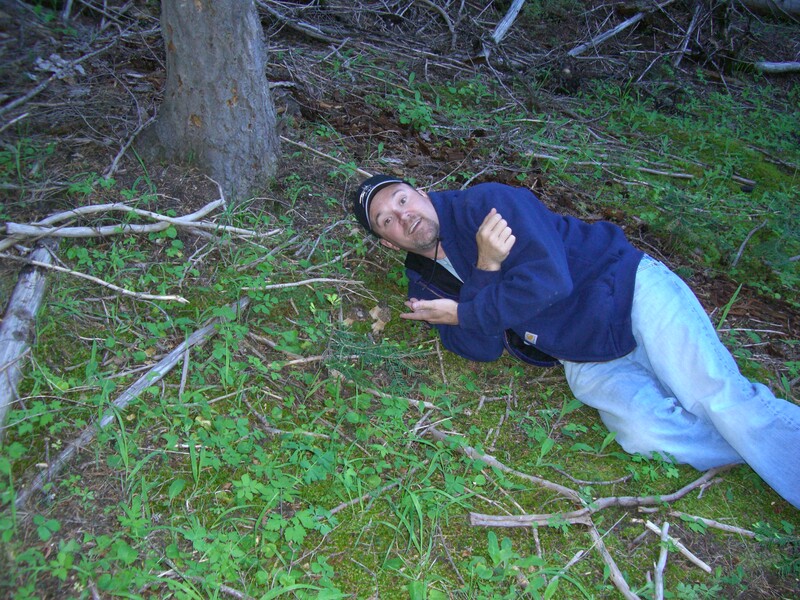 I have made people who hate mushrooms, like the taste of a fresh morel. At $49.99 a pound, I would speculate that 99 percent of the population has never even tried one. They are very expensive because they only grow one time a year and some would say very difficult to find in the wilderness. They are to some degree, but after years in the woods I find it to be relatively easy. I have a few friends, that go with me. Actually I only have two, my wife who I force to go because she loves eating them and my one of my long time friends who I grew up with, Trevor Storlie. I am not sure if Trevor has the obsession as I do, but he definitely finds competition and the two of us have made it a sport over the years. We even have a Morel ring that King gets to wear if he out picks thy other. Then thy other has to get to his knee and kiss thy ring. I guess it is sort of corny, but having your buddy get to his knee to kiss “precious” we find some humor too. Trevor and I always find the shrooms and he is fishing guide so it searching a species out is sort of like honing your skills and eyes for what you are borned to do. I apologize for the blur of this photo. It was taken by cell phone and without permission. Trevor rarely likes to be photographed in the wild, mainly because his wife thinks he has clients fishing…but he has scallywag himself off into the woods with me. 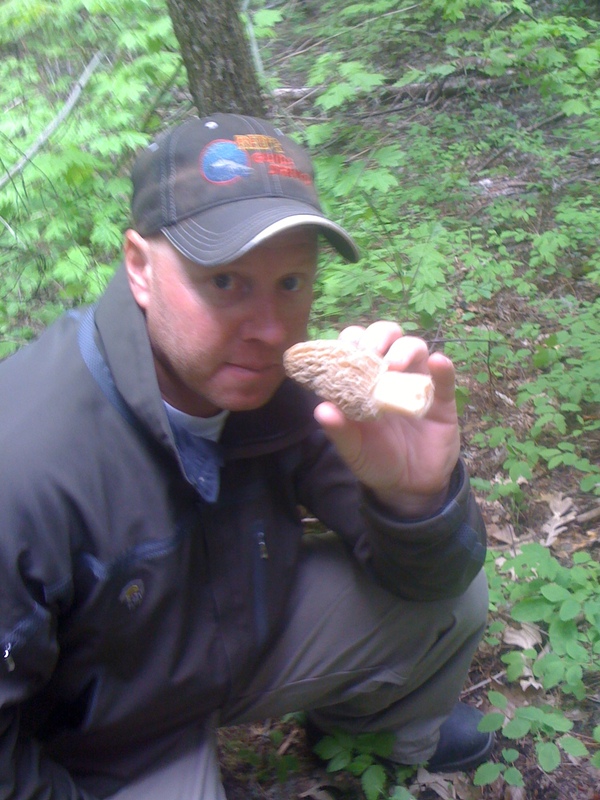 In his hand is what is called blonde morels. Please look below at mine, which is surely larger than Trevor’s. 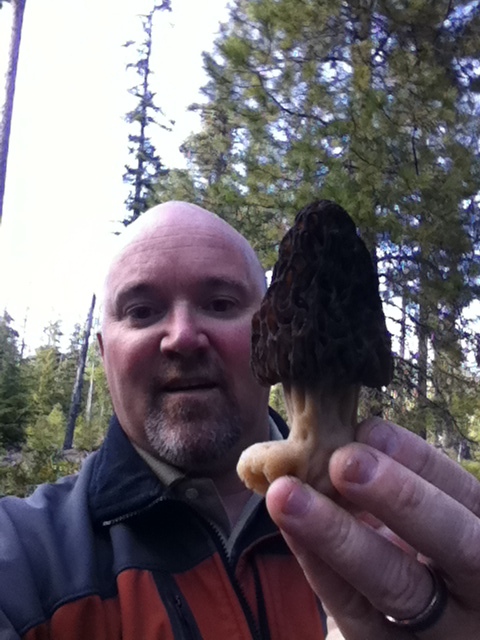 Here are some up in Trout Lake, Washington in April. 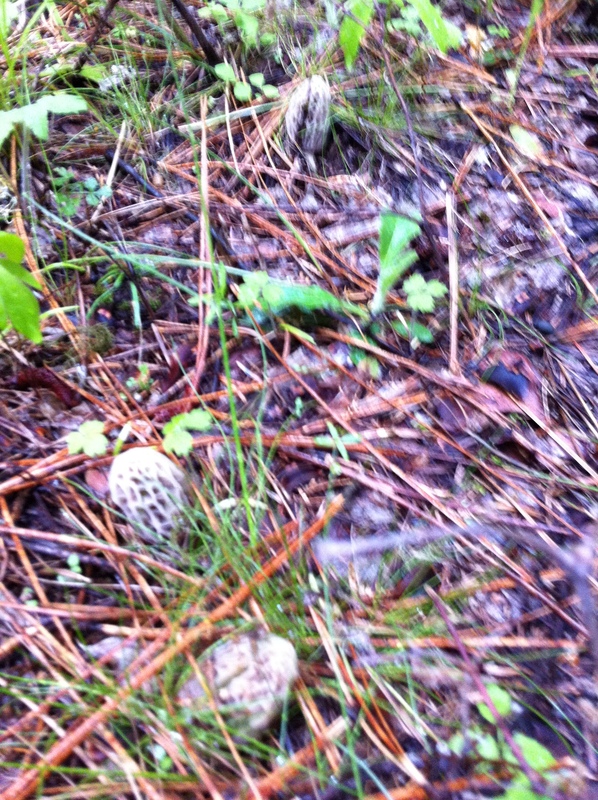 These are brown morels that are some of the first to come up this year. Notice how they camouflage themselves and usually come up in the color of their surroundings. Not much is known on what causes them to grow, what we do know is what they like above 52 degree ground temperatures, white pines, and fires or logging areas that are a year old. 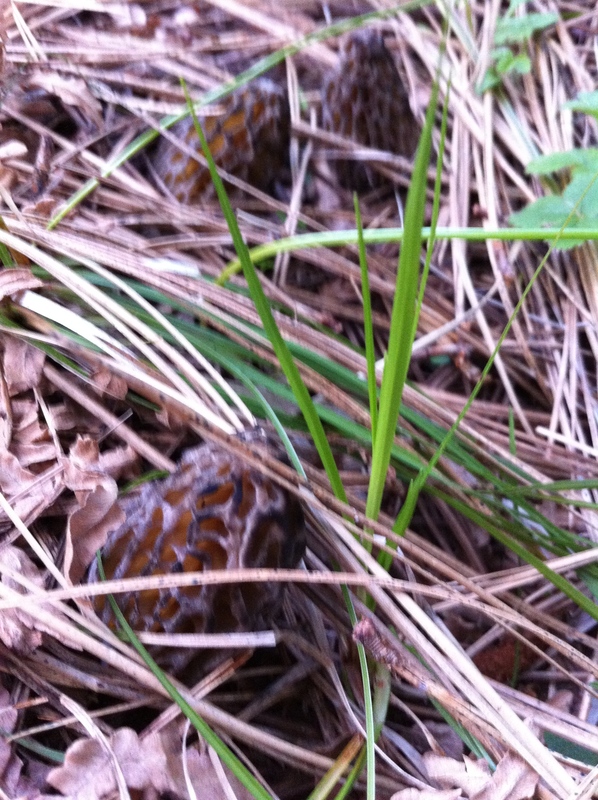 These are the first two Morel's Stephanie ever laid eyes on. I took my wife, Stephanie up hunting mushrooms in Mitchell, Oregon. She was only my girlfriend back then so I could talk her into everything because she was trying to impress me. When she was following me around in the woods wondering what all the hoopla was about. She was not all that impressed but like I said she was trying to win me over so she followed me around like a little puppy. These were the first ones she ever saw in the wild. That night I whipped about 20 up for dinner and after her first bite she said “We have to go out and get a lot more of these for rizzle”. That was about 6 years ago, and I still take her on the weekends to camp and look for mushrooms. Though she doesnt try to impress me anymore she still loves eating them. This one was taken with about 28 others right by Trevor’s house. He still does not believe that I picked them there because we always have to drive about an hour or more. 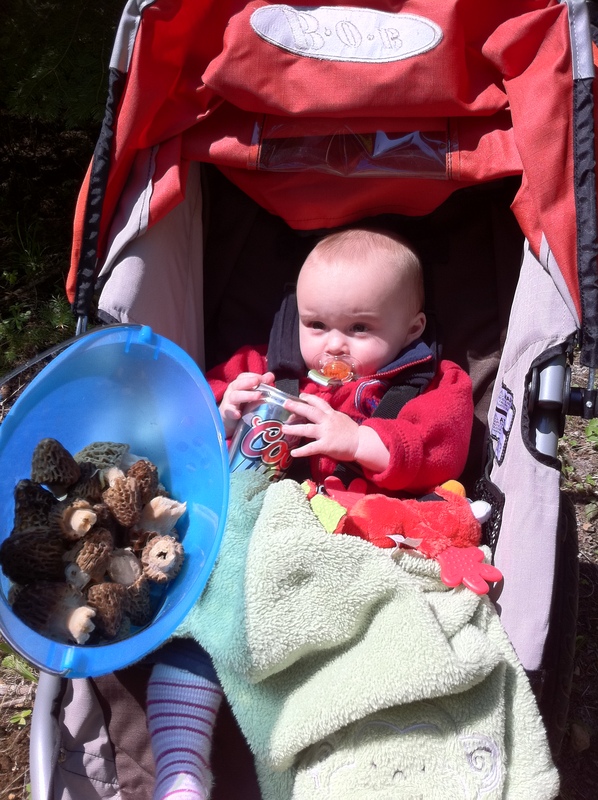 There is a lot to learn about hunting morel’s. First, you need some rain, then some sun and about 70 degree weather to start the shrooms popping. You need the right elevation, to high can be too cold. Remember the ground temperature is very important, to low they will not grow. Too high and they have already came and gone. The ground also needs rain so if it doesn’t rain for two weeks and the temps are right, no water to get them to pop. So you have to pay attention to mother nature. You also need a lucky bucket, I stole this one from Trevor, who stole it from his wife. Notice above it is full of Mushrooms, hence the lucky. Most of all is that you need have patience and endurance. Most people quit before they learn, they have been told all this stuff but do not find any mushrooms. Some times it takes time, then you whack them! Then you must have trained eyes. What makes Trevor and I so successful is that we both have excellent eyesight. We can spot them from 20 feet away. What I have learned over the years is not to look straight down, look out about 10 feet because you are able to spot them easier. I think the few times we went this year, we were able to both about 5 pounds apiece without trying that hard. The last time we competed with each other I am sure we each had over 150 apiece. It seemed every where we tried we found a pile of them. When you do find them, take out your scissors or knife and cut them, never pull them out of the ground!! 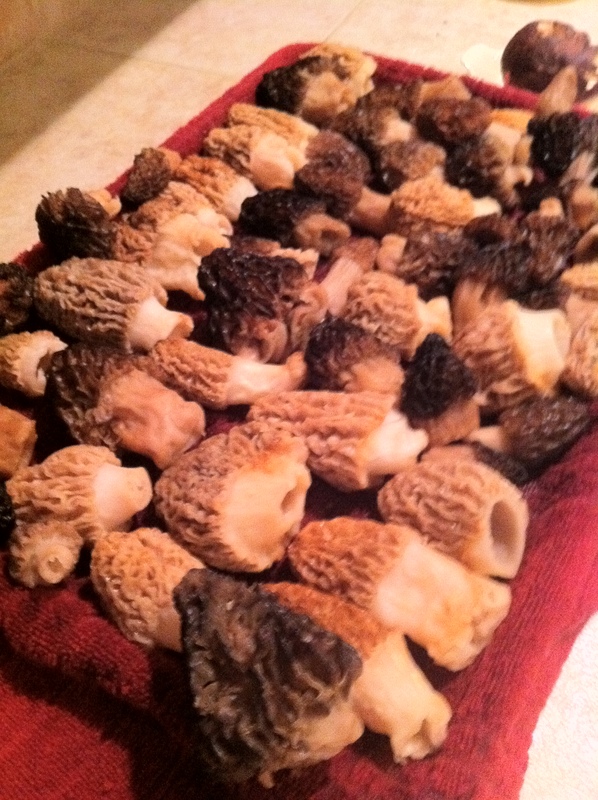 Make sure air gets to the morels too, never seal them in a bag. I wash them down, to get the dirt off them, then soak them with salt in the water. I usually put in a couple of tablespoons of salt for an hour, then drain, the resoak adding salt. This gets all the bugs out of them. After washing them, its important to let them air dry for an hour or so. After that, you can put them in the fridge on wet towel, but do not cover them. I usually put the towel on a cookie tray for easy transport. You can do this for 3-4 days. After that, you are running a risk of losing them and need dehydrate them. This is a safe and easy method. It takes about 10 hours, but produces a great end product that you can keep dried in a tight mason jar. 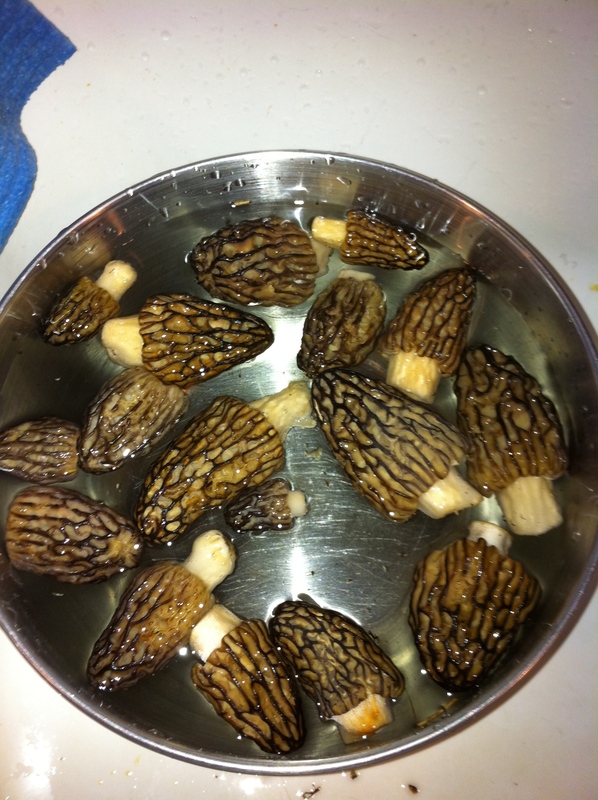 I have also froze them and that works but gives the rehydrated morel a poor texture. 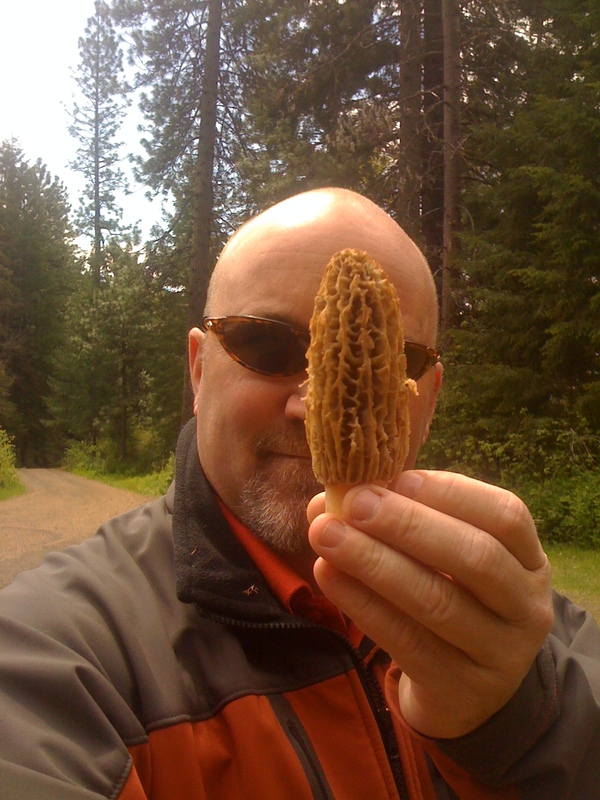 I try to eat as many as I can while fresh, there is nothing like a fresh morel. I am telling you folks, if you need an excuse to get out into the wilderness to harvest your own food, this one is it. Think of it like easter egg hunting, but instead you’re getting expensive mushrooms. It does take time to educate yourself, but in my humble opinion, walking around in the forest with the animals, fresh air, and beautiful surroundings definitely beats sitting at home on the couch. 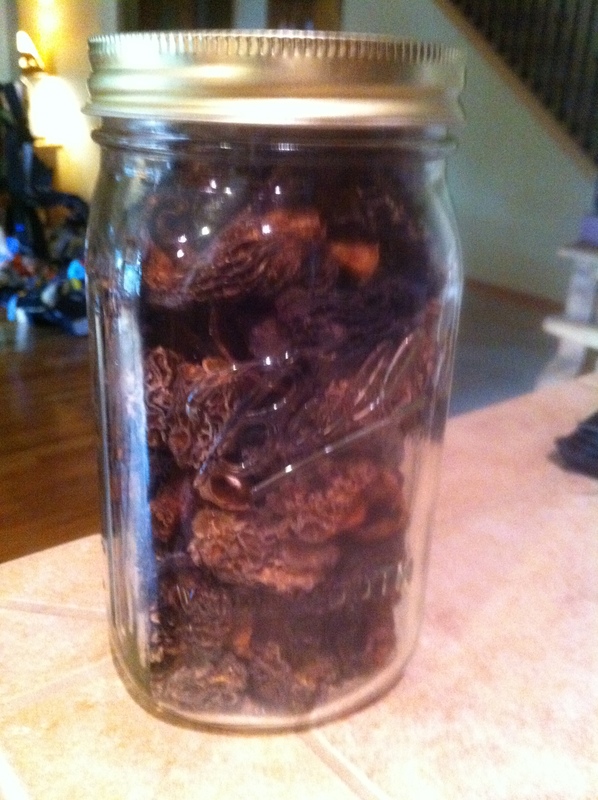 Here is what they look like dried up and in a mason jar. This is over 500 bucks worth. Actually that was the Clam Express because the photo was taken on a clamming trip.  I will blog about that later, but you get the point. 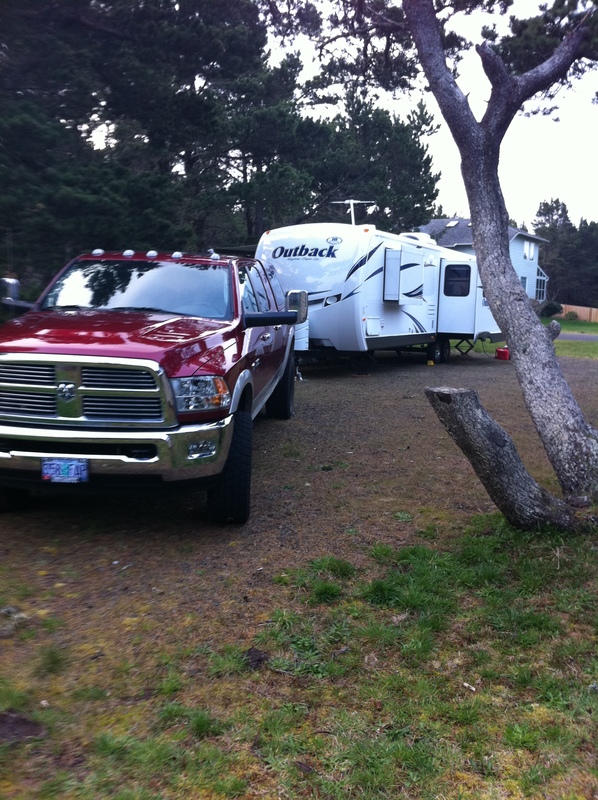 After years of sleeping in a tent and having a bad back, Steph and I bought a trailer….and WE LOVE IT. I was not going to get into any recipes just yet. I first had to explain the art of finding them. I will leave you folks with a little taste of this….blue cheese pesto stuffed morels and bone in pork chops on a cast iron grill.